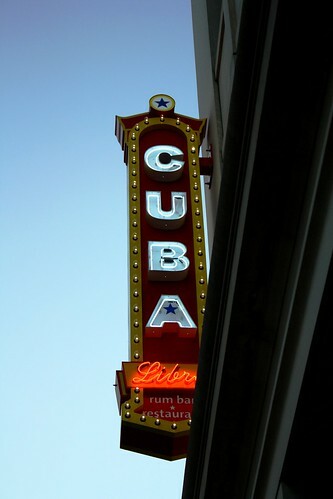 Although I’ve never been to Cuba, I am fairly certain that Cuba Libre Restaurant & Rum Bar doesn’t scream authenticity. 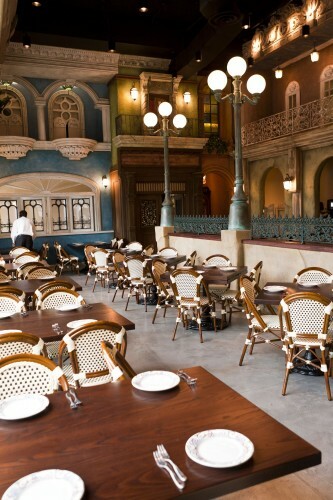 The restaurant’s interior, styled as an open air piazza, feels like the Epcot version of Havana. The plaster is artfully peeling in all the right places. At any moment, a mechanized figure from “It’s A Small World After All” could pop up from behind the false windows and burst into song. But like all things Disney, Cuba Libre is a happy, cheerful place. Maybe it’s the Latin music wafting from the background. Maybe it’s the rum. Either way, the restaurant has a lively, summery atmosphere that should be welcome as winter sets in. With locations in Atlantic City, Orlando and Philadelphia, Cuba Libre’s recent opening marks the chain’s first foray into Washington. The restaurant has made its name on “nuevo Cubano” cuisine, and dishes borrow heavily from Asia, South America and the Caribbean. 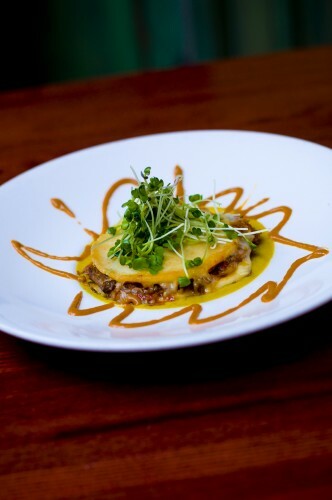 More than half the menu is devoted to small plates (ranging from $5 to $13), though classic and contemporary entrées ($16 to $32) are available for those who are morally opposed to tapas. On the two occasions I ate at Cuba Libre — once with a friend and once for a preview — I stuck with the small plates for maximum taste testing. Of the 14 dishes I sampled, only two were notably underwhelming. Both the Atún Africano (charred tuna) and the Pato Ahumado (smoked duck) were somewhat flavorless, and lacked the depth that most of the other dishes offered. But it was all uphill from there. In particular, the beef and pork dishes stood out as among the menu’s best. The pulled pork empanada was stuffed with sweet, tender meat and enveloped in a buttery, flaky crust. The Cochinito Chinito-Cubano (rum-glazed pork belly) was light on fat and heavy on melt-in-your-mouthness. The real showstopper was the Arepa Rellena, a corn cake filled with short rib and mozzarella. It was the perfect balance of sweet and savory, with melted cheese oozing out in all the right places. The Cesar de Oriente, a short rib spring roll, was also delicious: not too oily and boasting subtle, complex flavors. Other favorites included the Buñuelos de Espinaca, whose fried crust gave way to a wonderfully creamy blend of spinach and Manchego. The Yuca Frita (cassava fries) were also great though quite starchy: I found it difficult to finish the entire serving though I wanted to. The seafood dishes were very good, but carried less of an impact. The crab cake and scallop and tuna ceviches were fresh, meaty and creative. But still, they are not the dishes that I’ve been wistfully craving. Of course, Cuba Libre is not just about the food. 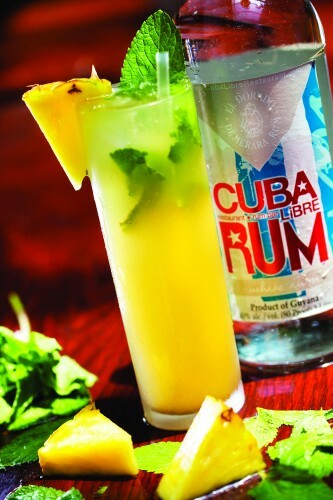 The restaurant prides itself on its 74 varieties of rum, six of which are produced under the Cuba Libre label. If you’re new to the scene, you can sample a flight of the restaurant’s 5, 15 and 21 year rums, which offers an easy introduction to the nuances of the aging process. The rest of the rum list consists mostly of aged spirits, with roughly a dozen whites, golds and darks mixed in. We sampled a few of the more unique varieties, including a chocolatey, nutty Pampero that was perfectly sippable — a great after dinner drink. There was also the Rogue Hazelnut Spiced Rum, infused with Oregon hazelnuts, orange peel and vanilla bean. It tasted like Christmas in a shot glass, which is a very good thing. If you can’t shoot rum straight, there are plenty, plenty of cocktails to choose from. Mojitos are the specialty (there are 14 on offer), but over two dozen tropical drinks, caipirinhas, frozen concoctions, sangrias and beers are also available. Many of the drinks have been created exclusively for Washington, including the Beet and Basil Mojito (a sleeper hit) and the Miami Hurricane, which is an uncanny re-creation of Hawaiian Punch. Only order it if you liked the stuff as a kid. A few other drinks were sampled in the name of research. The mint in the Grilled Pineapple Mojito cut the fruity sweetness nicely, and the spiked Cafe Cuba Libre quickly won over my coffee cocktail-loving heart. The only drink I tried that could use a little tweaking was the Mango Ginger Martini, which needed a bit more ginger to reign in the mango’s sticky sweetness. If you’re planning on checking out the restaurant in the coming weeks, you might want to visit on October 28, when the restaurant will donate 100% of all dinner food sales to the Trust for the National Mall. Can’t make it? Don’t worry— your appetite is as worthy a cause as any. Cuba Libre Restaurant & Rum Bar is located at 801 9th Street NW. The closest Metro stop is Chinatown/Gallery Place (Red, Yellow, Green lines). For more information, call 202-408-1600. I ate there last night while they’re still having the 25% off preview special. The mojitos were good – and I’m not a huge fan of mojitos. The appetizers were great… I think our table had a good spread of them and all were good. I had the Ropa Vieja as the entree – it was good, but not outstanding. The main room is a little noisy, but the room over on the far side behind the check-in area (by the restrooms) is quiet(er). The restrooms were a little too dark. The overall decor is really nice, albeit a little cheesy. The service at the bar was excellent. The service at the table was so-so: We asked for 7 to be seated and they gave us a table for 5. One person asked to have her leftovers packed to go, and they tossed it. The bill had one error. Overall, I’d go back just for drinks and appetizers/tapas with a friend, but I’d avoid going there with a group again. Grilled pineapple mojito? Yes, please! Avoid this place at all cost! Definitely had the worst dining experience at Cuba Libre DC this past weekend. They deliberately rip off customers by watering down their already expensive mojitos, then charging $13 per extra rum shot to make the drinks alcoholic (and not telling you until you get the bill)! The food was also very bland and overpriced (paid $468 for a party of 7 with 4 appetizers, 2 entrees, one sandwich, and overpriced/over-iced/over-juiced mango mojitos). The icing on the cake was the manager who tried to justify the added cost of rum shots ($52), argued with our party to no ends, and pretty much told us he didn’t care about negative reviews. DC has no place for this type of arrogance! I highly suggest you avoid this place and keep walking in just about any direction and you will land in better restaurants with better service, great food, and drinks that actually own up to their names. Cuba Libre definitely gives the DC restaurant scene a bad name. Food for management: with this type of arrogance from your shift managers, disservice to your clients who choose to come to your establishment and spend their hard-earned money, and the abundant restaurant choices within half a block, you will not last long in DC and will be the first restaurant to fail in the Penn Quarter area. Make sure to look within when that happens! Raised in nearby MoCo, Rebecca happily jumped the District line in 2005. When not stuck behind a computer, she can be found exploring the city's many wonders, usually with her trusty canine sidekick Jasper Jones. Questions, comments, concerns? Email her at RebeccaGross (at) WeLoveDC.com.